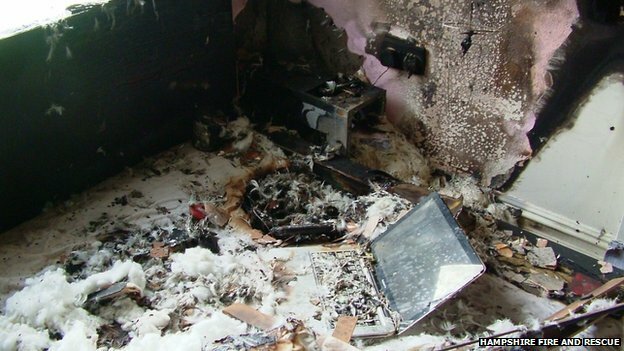 An explosion that destroyed part of a home in Hampshire has been traced to a charger used to power an e-cigarette. Investigators found an "unbranded" USB charger plugged into the decimated bedroom in Southampton Road, Ringwood. They said the overheated e-cigarette started a fire, which led to the explosion of an air horn canister. Hampshire Fire and Rescue investigator Dan Tasker said: "The consequences of using the wrong charger with the wrong device can be devastating." The charger was not one that came with the e-cigarette. Mr Tasker said the incident on 14 July was "the latest in a string of incidents in the UK involving the use of cheap or inappropriate chargers". He added: "We are extremely relieved that on this occasion no one was harmed." Hampshire Trading Standards said e-cigarettes can be susceptible to overheating due to the type of battery they contain. A spokesman said: "The message is do not buy cheap or unbranded chargers for use with e-cigarettes, mobile phones or any other devices.